Home » Blog » Group Policy Objects (GPOs) » Welcome to Groups! We’re happy to announce that JumpCloud’s “Groups” functionality has gone live for all new organizations signing up for the JumpCloud service. As will be explained below in more detail, customers and evaluators who had established accounts before April 11th, 2017 will be invited to migrate in the coming weeks. In JumpCloud’s earliest incarnations, we designed the product’s grouping mechanism, an object class referred to as “Tags”, to perform in a very specific way: to provide many users access to many systems. This use case was primarily designed and suited for a technical audience (e.g. DevOps teams), where a team of admins could access a set of servers to do their jobs. In other words, a user-to-system matrix association. As we evolved JumpCloud in late 2014 to focus more purely on directory services, we extended the concept of our “Tag” object to do more and behave more like a traditional role based access group. For example, the users within a Tag could act as an LDAP groupOfNames or POSIX group for resources integrated to JumpCloud. 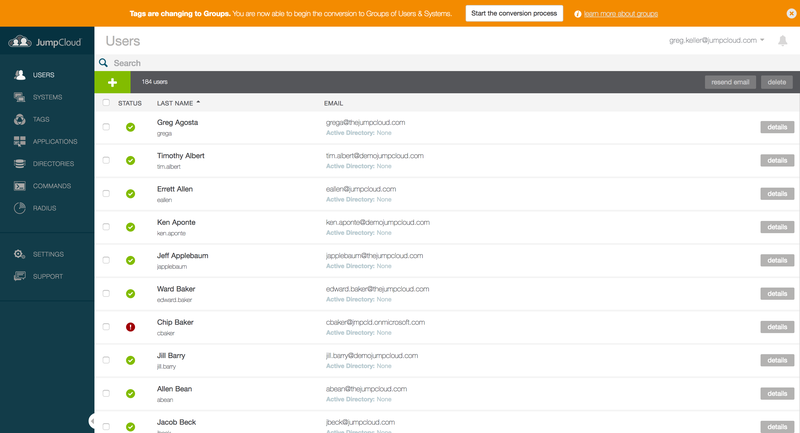 Users in a Tag could also act as group-based access control for our SSO apps or RADIUS servers. Further, an admin operating JumpCloud would still need to visit several decentralized user interfaces to completely on or off-board an employee from JumpCloud and subsequently their resources. It became clear that “Tags” had done its service and needed to be evolved. Groups are exactly what their label implies: Groups of objects. We implemented this system to simplify the experience for admins and properly support a new association model (e.g. a graph model) between objects – something we feel will give limitless scalability to our directory architecture and model over time. Groups are collections of JumpCloud objects (e.g. a collection of users or systems). These group collections are then associated with other objects to form relationships between them. –What kind of Groups does JumpCloud support? NOTE: You can review our Getting Started with Groups here on our Knowledgebase. Directories (G Suite, Office 365 and LDAP). When a Group of Users is associated to those associated resources mentioned above, an admin simply adds a user to give them access to those things or removes the user to take away access. They can be leveraged for DevOps purposes, primarily via the API as is done now with Tags to auto-scale virtual infrastructure. They can be leveraged to execute commands against en masse. –What kind of Groups does JumpCloud NOT support? Nested Groups or ‘Group Hierarchies’ are not supported – Creating a Group and then nesting a Group within it (e.g. “Sales Team” Group of Users containing another sub-group called “SDR Team” is not available initially. This will be implemented in the future. Tags will automatically convert into a unique Group of Users and a unique Group of Systems. Both will be associated to each other to ensure connectivity between users and their systems. 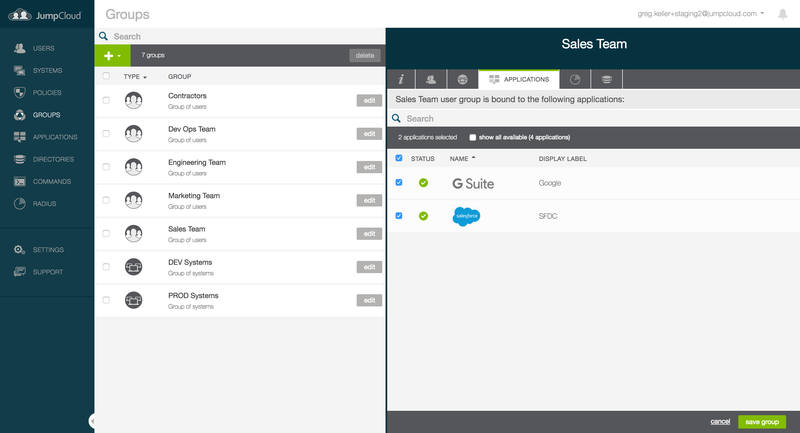 Tags created and leveraged for SSO application access will convert into a Group of Users with the associated application bound to the Group. SAML Connectors – All applications must be bound to a Group of Users to provide access to users. LDAP-as-a-Service – The LDAP on/off toggle has been removed and now Groups of Users can be elected to add those users to LDAP along with their membership to the group. 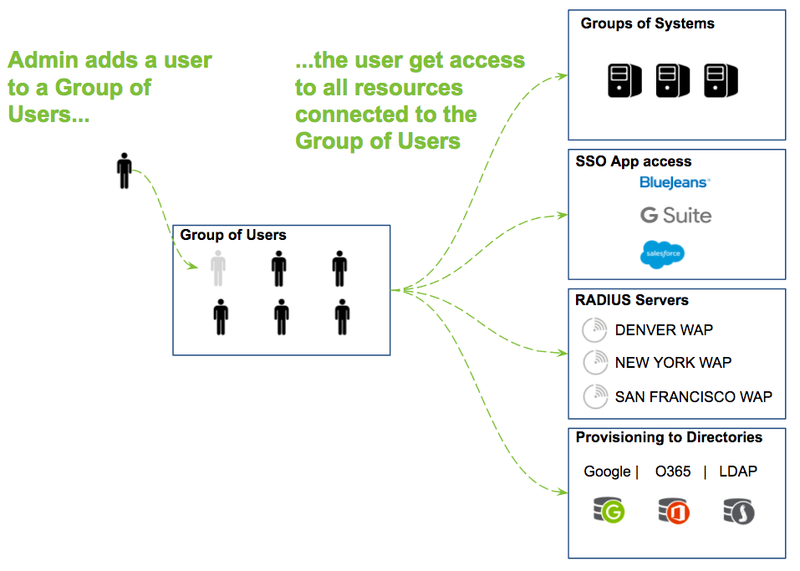 RADIUS-as-a-Service – Similar to above, RADIUS servers must be bound to a Group of Users to gain access. NOTE: You can review our Binding Users to Resources article here on our Knowledgebase. 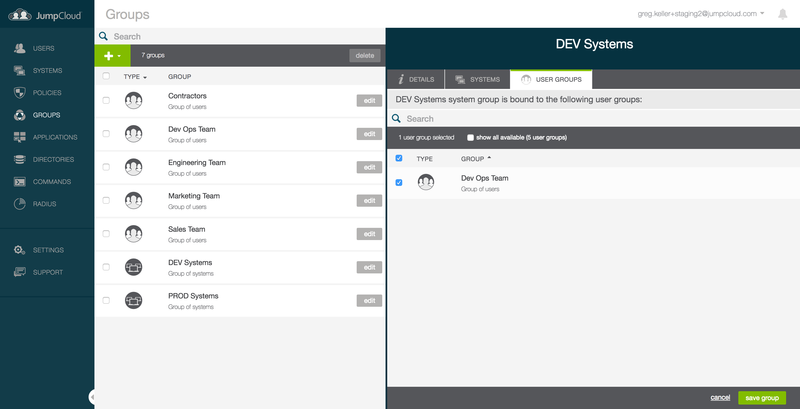 With the move to Groups, we have taken the opportunity to introduce new API endpoints to operate and integrate with Groups functionality. This also includes a complete overhaul to our API documentation. Version 1.0 API Documentation (e.g. for orgs still using Tags) can be found here. Version 2.0 Documentation (e.g. for those migrating to or already using Groups) can be found here. We hope you’re as excited as we are for Groups! Please be sure to contact our Customer Success team for any insight or assistance planning your migration from Tags to Groups!